After seeing a recipe for Hot Cross Buns on the Cellardoor Magazine blog, I knew I had to make them! I'm usually not a fan of these Easter treats as I'm not keen on mixed peel, however a light bulb went off inside my head - why not add cranberries instead? Thank you light bulb! 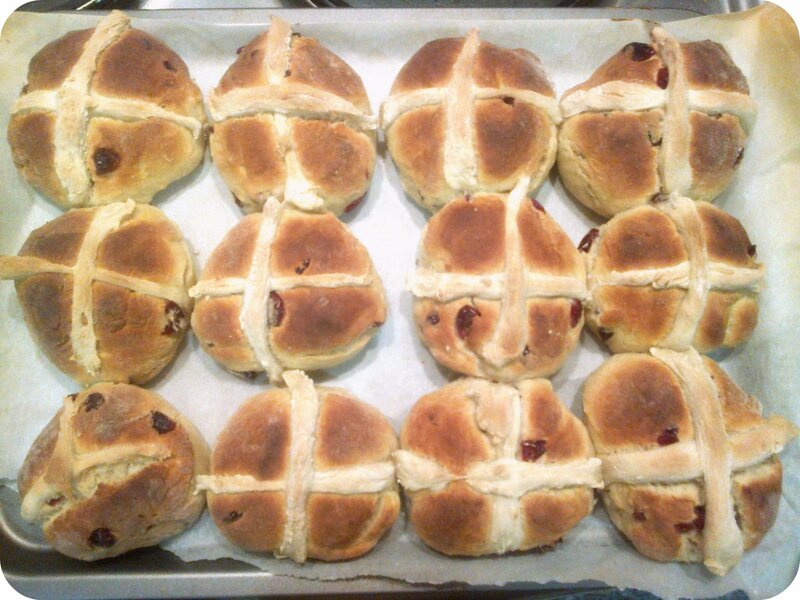 I now have lots of lovely girly Hot Cross Buns waiting to be toasted and smothered in lemon curd. If you get sick of chocolate this weekend, I suggest you try these! You can find the recipe here. I didn't actually follow the recipe I'm sending you all to, as I misread it and tipped all the flour in at the start - silly billy. I'll definitely be making these again and will post a recipe up myself. There are a few things I'd like to change; adding some more cinnamon, maybe some lemon zest and other dried fruits. I also want to try piping a flour and water paste onto the top of the buns to create the crosses. Despite all these additions and alterations, my first attempt were really yummy and I was very pleased with how they turned out, in spite of the distaster I had at the beginning! They're not perfect but they sure do taste good! They look so nice, I'm really hungry right now and keep seeing blogs about food, arghh! Haha, trying to save myself for dinner!